How can something so Wrong be so right? Given that Melbourne’s Comedy Theatre was the recent home of The Mousetrap and A Murder is Announced, it seemed that Cornley Polytechnic Drama Society had picked an ideal home for the opening of their Australian tour of The Murder at Haversham Manor. Little did the hopelessly inept well-intentioned company know that a panoply of pandemonium was about to befall them, stretching the very last nerve of society president, director, lead actor, designer, publicist, dramaturge, vocal coach and fight choreographer Chris Bean to snapping point. 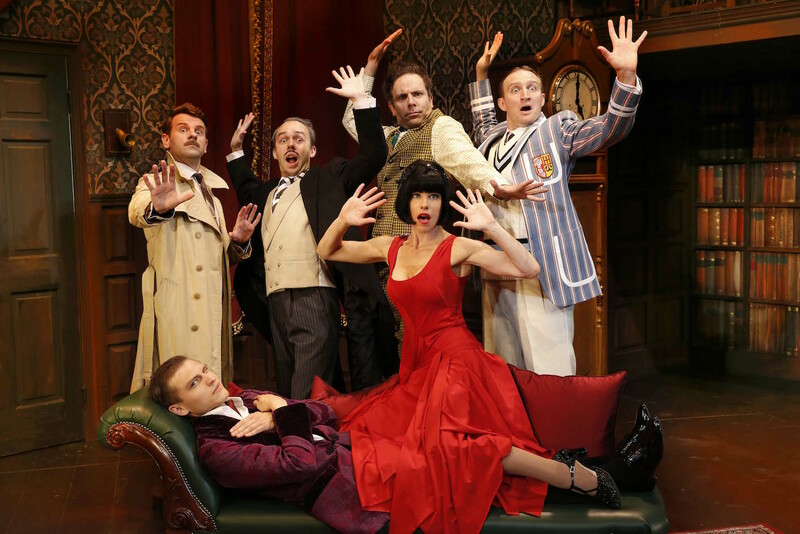 All this merry mayhem is, of course, the creative construct of highly successful English troupe Mischief Theatre Company, who struck West End gold with The Play That Goes Wrong. Commandeering a decent slice of London’s West End, the company has added Peter Pan Goes Wrong (also shown on the BBC last Christmas) along with their latest smash hit, The Comedy about A Bank Robbery. Achieving chaos through control, the well-rehearsed company performs all manner of stunts, with the live, on-the-fly element raising the stakes considerably. The physical comedy is further enhanced by the “real life” characters of the Society actors. Writers Henry Lewis, Jonathan Sayer and Henry Shields, of Mischief Theatre Company, have crafted a keenly observed set of amateur theatre acting stereotypes, which anyone who has trod the boards at their local community playhouse will easily recognise. Tightly wound Chris Bean (Nick Simpson-Deeks) clings desperately to the serious nature of his production. Siren Sandra Wilkinson (Brooke Satchwell) confuses acting with pretty posturing. Robert Grove (Luke Joslin) blanks on his lines and freezes at the slightest script alteration. Dennis Tyde (George Kemp) has key words written on his hand, and mispronounces them anyway. Crowd favourite Max Bennett (James Marlowe) breaks character to beam with delight whenever he earns a laugh. The underlying tension to the Society’s performance is the actors’ sheer determination that the murder mystery play will progress without any deviations. Their efforts to improvise to cover errors inevitably spiral into further adversity. Their inability to listen to each other’s lines results in any number of misunderstandings and confused scenes. Again, anyone who has directed or performed at an amateur or school level will really enjoy this aspect. Australian cast director Sean Turner has recreated Mark Bell’s original direction with confidence and flair. Comic timing and physical comedy are very good, and will doubtless become even tighter as the tour progresses. The dialogue is performed without amplification, as should be the case in all good plays, but vocal resilience and clarity still need some strengthening, especially lines spoken offstage or close to loud laughter (of which there is plenty). Nigel Hook’s design harbours a myriad of hidden tricks that are unfurled throughout the performance. Melbourne born costume designer Roberto Surace adds to the visual comedy with a set of deliberately flawed costumes that match the limited imagination and resources of the Society perfectly. Surace’s wit extends to the various insignia on the clothing of the “backstage crew;” try to read them all if possible. Ric Mountjoy’s lighting design is another well-employed aspect of the comedy. The Australian production is expertly re-lit by experienced local designer Jason Bovaird, who brings an opulent glow to the various interiors and exteriors of the Haversham Manor set. Simpson-Deeks is marvelously cast as rigidly uptight Chris Bean, speaking with a wonderfully rich toffy tone and conveying a churning undercurrent tension with very effectively underplayed expression. Joslin closely attunes his commanding presence to the comic stylings, proving a great sport at entangling himself in props in the name of physical comedy. Satchwell conveys Sandra’s vapid narcissism with verve, giving as good as she gets when she Sandra must fight stage manager Annie (Tammy Weller) for her role. Guest English actor Marlowe lands many of the best moments, given Max’s propensity for mugging, his over-the-top physical gestures and his crippling fear of human intimacy. George Kemp anchors one of the show’s most farcical set pieces when his Society character Max repeats a line that triggers a potentially infinite loop. Kemp’s performance of a dismal actor is also nicely underplayed. Man in Chair was accompanied to the Australian premiere of The Play That Goes Wrong by Master Ten, who was very well engaged in the action, and especially enjoyed the precarious stunts on the collapsing mezzanine. 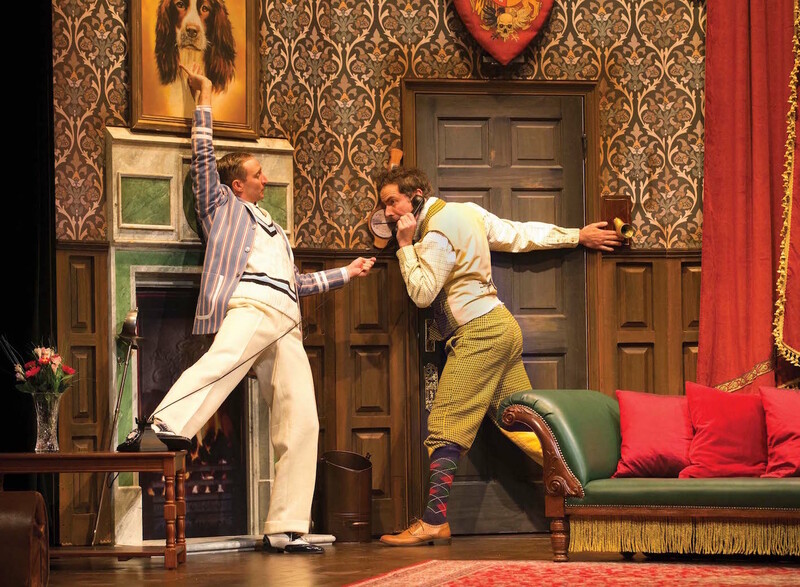 A broad comedy for all ages and all theatrical interest levels, The Play That Goes Wrong is enjoyably daffy theatre. 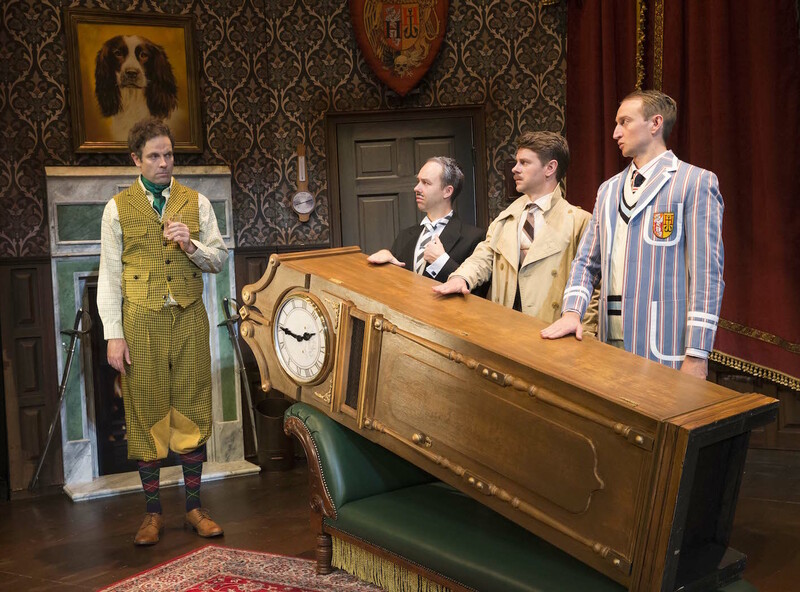 The Play That Goes Wrong goes wrong in Melbourne until 26 March 2017, before causing further havoc in Adelaide, Sydney, Canberra, Brisbane and Perth. Footnote: Nick Simpson-Deeks’ headshot in the program is just too wickedly perfect. I have just returned from the Adelaide preview performance and I must endorse the above review. This show is ‘Noises Off’ on speed. It is better than ‘Fawlty Towers’. It takes farce to new places. I am one who has directed and performed at amateur and school level. I have observed onstage ‘death’ in all its inglorious tragedy. The actors in the play within the play exact each last slow burn of onstage pain and every cockup that must be ad libbed away from and taken them to new levels of cringeworthy hilarity. 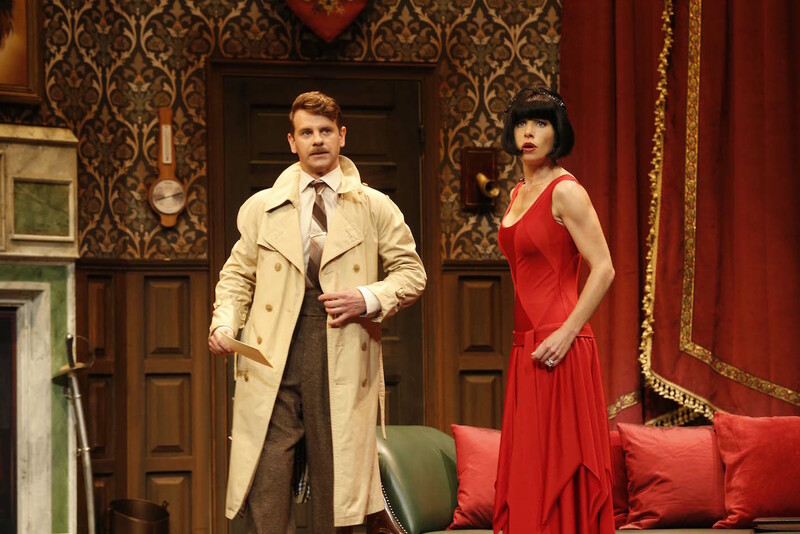 ‘The Play That Goes Wrong’ is not just aptly titled. It is a masterpiece of understatement. Five stars. Glad to hear how much you enjoyed the show Jon. Melbourne was lucky to have the premiere but I bet the production is getting even tighter and funnier now.